On top we have the most powerful and advanced data management features that enable fast, easy, secure, audit-able data flow through organizations. DaaS is built on top of other technologies. On the bottom we have the minimal building blocks starting with storage snapshots. 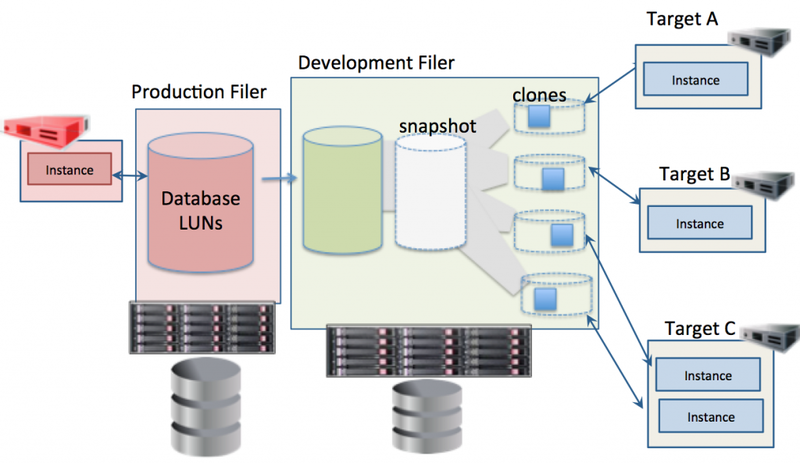 Storage snapshots can be used to make “thin clone” databases. Storage snapshots have been around for nearly 2 decades but have seen minimal usage for database thin cloning due to the technical and managerial hurdles. Part of the difficulty with creating thin clones is that thin cloning requires work by multiple people and/or teams such as as DBAs, system admins, storage admins etc it takes to create the thin clones. Depending on your company the more or less bureaucratic steps you will have (one customer reported 300 steps to thin cloning) to get a thin clone database allocated. If you are the DBA, Storage, Systems guru all rolled into one at a small company, and if so bravo, you can probably do it pretty quick. On the other hand if you wear all those hats, you are probably the crucial person in IT and most critical IT processes grind to a halt because they depend on you and you are super busy. The easiest way to create a clone is to snapshot the production storage. To snapshot the production storage, either shutdown the source database, take a snapshot or more likely put all the table spaces in hot backup mode, take a snapshot, and then take all of the table space out of hot backup mode. If the database spans more than one LUN it may take special storage array options to snapshot all the LUNs at the same point in time. 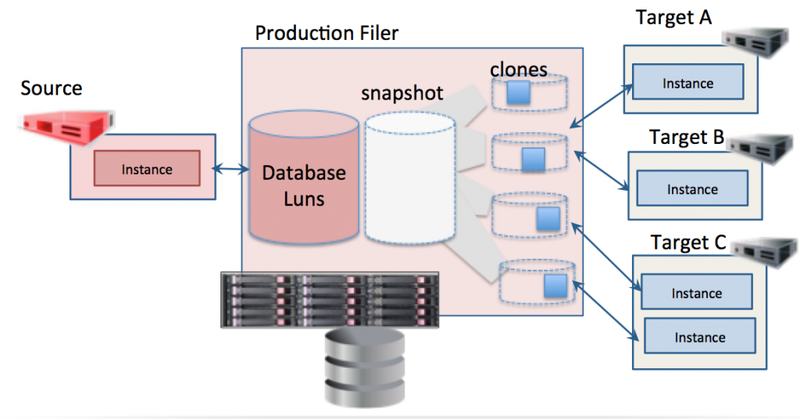 Once the all the database LUNs are snapshot, then you can use the snapshots to create a “thin clone” of the production database on the same storage as production. What we want to do is somehow get a copy of production onto some non-production storage where we can snapshot it. This means making a full physical copy of production onto a “development filer.” Once a copy has been made we can make clones by snapshoting the copy. These snapshots then require configuration to make them available to target machines either over fiber channel or mounting them over NFS and then recovering the database on the target machines. Problem with this scenario is that what if tomorrow we want a clone of production as it is that day? Currently we only have the copy from yesterday, thus we have to copy across the whole copy of production onto the “development filer.” Continually copying the source each time we need a clone at a different point in time defeats the purpose of creating thin clones in the first place. In order to overcome the obstacles creating thin clones, all the steps can be optimized and automated with a technology called “Virtual Data” (like Virtual Machines). Virtual data just the first step in automation. The next step is adding all the processes, functionality and control to manage the virtual data which is DaaS. File system snapshots address the very bottom of the hierarchy, that is, they only manage storage snapshots. They have no automated thin cloning of databases. Without automated thin cloning of databases there is no end-to-end processing of data from source to thin cloned target i.e.virtual data. With out virtual there is no DaaS. DaaS re-invents data management and provisioning by virtualizing, governing, and delivering data on demand. Most businesses manage data delivery with manual, ad hoc processes: users file change requests, then wait for DBAs, systems administrators, and storage administrators to push data from system to system, bogging down production applications, networks, and target systems with long load times. Data delays cost businesses billions a year in lost productivity and low utilization of systems and software resources. Reduce compliance risk through better governance, data security. Businesses need to manage data as a strategic asset across their operations, applying the same rigor as supply chain optimization for manufacturing companies. Leverage data with self service refresh, reset, branching, bookmarks, integration.